Waimea Bay, O`ahu, Hawai`i (January 1, 1999)--In monstrous surf, Hilo's Noah Johnson won the The Quiksilver in Memory of Eddie Aikau today catching the biggest and best of the consistent 20-25-foot waves at Waimea Bay on Oahu. Johnson flew in last night from the Big Island and for his daring efforts won the $55,000 first place check. It was standing room only on the beach and traffic was snarled for miles in both directions. But a huge crowd made it to the beach to watch Johnson and 23 other big wave surfers catch ride after ride in the often close out surf. Johnson, just 5'6" was one of the smallest surfers in the contest and was dwarfed by the huge sets. The payoff came when Johnson, riding a 9'6" Bradshaw surfboard, caught one of the biggest waves of the day, estimated to be over 25 feet. When asked if he had done any big wave training, Johnson replied "just surfing a lot. I think that's the best thing you can do. It's a contest so it boils down to whoever gets the best waves." It required a lot of patience for Johnson to wait for the bigger waves when there were so many "fun" rides. But instead of catching every wave he let the little ones go and forced himself to wait. "After the big one I kind of stopped caring," Johnson said. "Everyone in the heat was having a good time and laughing." On accepting his prize money, Johnson dedicated his win to the late Todd Chesser, who was killed in a surfing accident last year. Along with catching one of the best rides of the day, Johnson also caught a classic wipeout, appearing to fall out of the sky as he tumbled off his board and into the turbulent surf. And to the question of whether what was next for him, he said: "There are lots of things to do in the surfing world and I want to do all of them." Australia's Tony Ray, who commented "I feel like I've won," was second and received $10,000. Third went to John "Johnny Boy Gomes who got $$5,000. Santa Cruz' Peter Mel was 4th, $3,000. Hawaiians Rusty Keaulana was 5th and 6th and received $2,000 and $1,000 respectively. All other contestants received $600 each. Johnny Boy Gomes got a standing ovation when he took off on one of "three waves of the day." An outside wall that contest officials estimated at 20-plus feet. He dropped down the face like it was a Makaha small-wave afternoon and exited out the top with arms raised while the beach crowd cheered. The judges called it the wave of the day and gave him a score of 96 out of a possible 100. "It was such a big wave it wouldn't let me down," Gomes said. "It just kept sucking me back up the face like a vacuum. I kept asking myself 'am I gonna make it?'" In the same heat, Michael Ho took off on a huge right hander and rode it all the way to shore; switching direction to go left and get tubed. The crowd screamed as he got covered, but then went silent as seconds later he emerged from the white water waving for help. Lifeguards went to his rescue and carried him in to shore, where he spent about five minutes on a backboard before he was able to walk away. "I think my board hit me when I was screwing around in that shore break," Ho said as he walked back to his waiting family. "I was afraid I was going to drown in front of everyone in two feet of water." The contest is an Association of Surfing Professionals specialty event and only been held just three and a half times since it was inaugurated 21 years ago. It is named after former Honolulu lifeguard Eddie Aikau who was a crew member aboard the Hawaiian sailing canoe Hokule'a. When the vessel overturned in the Kaiwi (Molokai) Channel and 15 lives were put in peril, Eddie volunteered to go for help on a 10-foot surfboard. He was never seen again. Heats were 45 minutes long with a five-wave total and the top three rides scored on maneuvers, tubes, wave height, and length of ride. Judging also includes staying in the most critical position on the wave, stalling, cutbacks, traversing the lip and all movements that allow a surfer to remain in that critical section of the wave are also judged. "It's fun out there, pretty nice drops," said Tom Carroll. "You can sit further out and get them (the waves) on the boil. You've still got that kind of radical feeling in the drop." 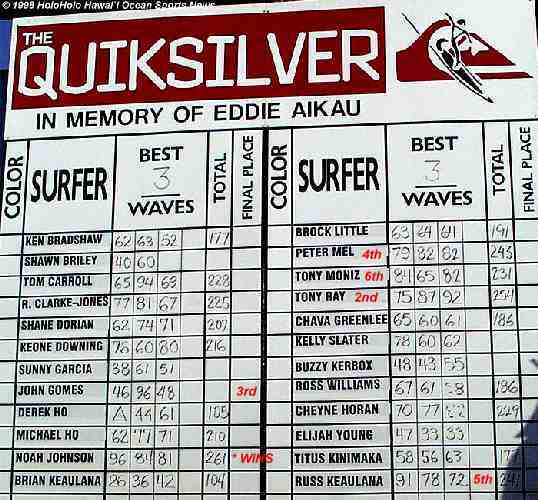 Statistics: The contest was inaugurated in 1986 as a tribute to Aikau. The foundation of the event is big, challenging surf, which must average 18-20 feet the entire day. This is only the third time the event has been completed. Clyde Aikau won the first event in February 1987. In January 1990 Keone Downing won the second event in epic, clean 20-25 foot waves. Each time the winner won a $55,000 prize. In December 1995 "Half an Eddie" was held when contest director George Downing called the contest on in the morning and then canceled the competition after Round 1 because the swell dropped below 20 feet.